Just a few quick words in-between longer posts. As I’ve mentioned here and there, I’ve decided to do a big, complete Discworld re-read a couple of years ago. I’ve sped it up last year, went from Mort to The Amazing Maurice… and this year I’ve already listened to the Night Watch and The Wee Free Men to start The Monstrous Regiment only yesterday. I love it! Even more, then the first time. And some books I read for the first time. I will sum it all up after I finish. But, it was not enough Pratchett. I’ve read his nonfics, and now I’ve also read his first novel (although in its re-written, later version), The Carpet People. What a funny little book! I don’t know how much it’s changed from the original version – anybody here read that? – but it’s a great debut and clearly a work of a beautiful, brilliant mind. The humour is already there, Pratchett’s satirical sense, his ability to show us an absurd fantasy world – and through this, the absurd of the one we created here on Earth. Sure, it was refined later on, but this book is nothing to be ashamed of. Well, maybe not end all adventures, not really, but to save their flat world from eminent danger – definitely. Our brothers are from a barbaric (but friendly) tribe of Munrungs, living under the authority of a benevolent Dumii Empire. One – Glurk – is an archetypical chieftain, not too smart – being smart is the job of his shaman/philosopher, Pismire – but brave and dedicated. The other, Snibril, is smart and adventurous. Together with a group of companions they will have to defeat an invasion of Mouls, a devious, aggressive race of ugly creatures. Invasion made easier by the Fray – force of nature/act of God in this world of carpet dwellers, but in true (most probably) just a sweeping of carpet by humans – good thing they don’t have a vacuum cleaner! It also helps that they leave many thing for the micro-peoples of the carpet to explore and use – coins that turn into metal mines, matchsticks that give them wood, varnish is also very important for the local economy, and it is taken from a chair leg. What a way to deal with a conflict – and cooperation of civilized and nomadic peoples, of advanced and primaeval cultures, of change and tradition. Of benefits of tolerance, nay, understanding and friendship, of what brings us together, even if we look, worship and cook differently. There are bad guys that aim for violent subjugation if all the others, and they are dealt with – in a battle, nonetheless – but that is not the point, and the battle is short and not that bloody. In comparison to Pratchett’s later books, it’s naive, calmer, quite ironic but not sarcastic. Characters are nowhere as complex as the heroes and heroines of Discworld. While not as good, it’s still fresh and highly enjoyable. It’s my intention to tackle Wintersmith next as my next Pratchett, in time for #MarchMagics celebrating the work of STP and Diana Wynne Jones. It’s proving a slow pilgrimage through Discworld but I’d rather savour than rush it, especially as of all the comic fantasy I’ve read (which, to be honest, is not a huge amount) his is the only I’ve had both laugh-out-loud moments along with heart-felt emotions. I love Pratchett but haven’t actually read this yet. I’ll have to find a copy! Well, at least you tried 😉 I love satire so he’s definitely one of my favourites, but not all his stuff is gold to me, I couldn’t get into the Long Earth, for example. I totally agree. This one was enjoyable, but far from Discworld’s quality. 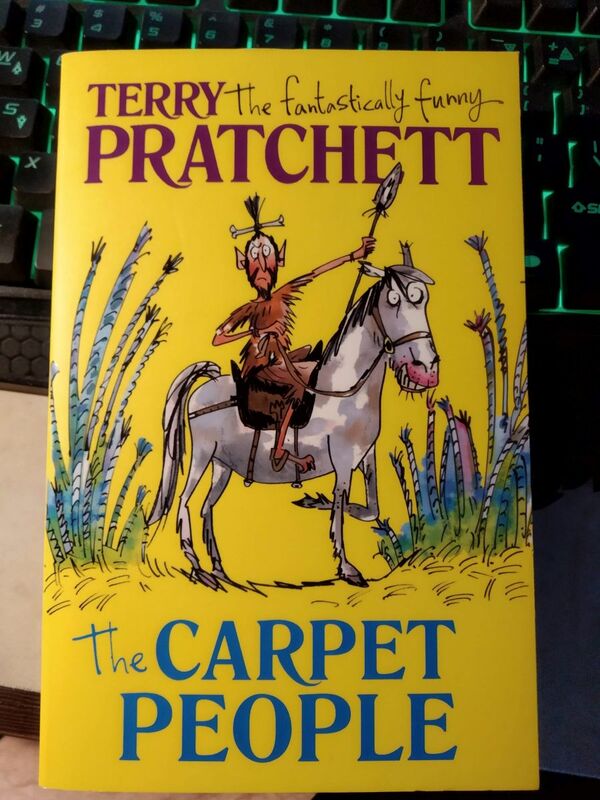 It was most interesting as an insight into younger Pratchett’s mind..
Something about the cover and the premise made me think of Dr. Seuss too. Really interesting novel and it’s nice that you’ve got so much history with Pratchett and still got “new” ones to discover. Is it really different (in a sort of bad way) compared to his Discworld books? It’s kind of raw, unpolished in comparison,and a bit naive. Still very good, but not as brilliant- or sharp,as Pratchett’s Discworld satires. Gosh it’s a long time since I read this one! I definitely need to do a reread!! I bet I’ll still find it enjoyable too 🙂 Lovely review!